Why Set It Equal to Zero? At this point, we had not solved a single quadratic equation yet. My students graphed and launched right into solving like it was no big deal at all. I thought they had finally made the connection between the solutions and the intersection of the line and the parabola. Most of my students correctly selected Kristen; however, I was extremely disappointed in their explanations. I expected their explanations to be more in depth after the many discussions we had about solving for the x-intercepts. They mostly went with the procedural explanation of setting it equal to zero. I wanted them to explain WHY we set it equal to zero. I don’t know how to ask that without directly giving away which student’s work is correct in the first place. There’s also a problem with the many responses claiming Kristen is correct because she found two solutions. This tells me I need to do more examples with only one. At this point in the year we’re moving onto exponentials, but I’ll be thinking about this problem for a while. Any advice would be greatly appreciated! In the crazy weeks between midterms and February break, this was definitely One Good Thing. I wrote about my plan to try flipping a lesson here and am finally getting around to recapping the experience. Overall, it was very positive and I’m definitely interested in flipping an entire algebra unit later this school year. I teach two honors algebra 1 sections, but only flipped my lesson on “Finding X- and Y-intercepts” with one of them. Class Section #1: Students were assigned to watch a 6 minute video I created and posted on youtube. I put the link on my class website and also emailed it to my students. I gave them a notes page to fill in as they watched. The video had 3 examples, and after the second one, I instructed students to stop the video and try the third example on their own, and then watch me solve it after they tried to. However, I forgot to ask if anyone actually did pause and restart the video. Oops. I took Algebrainiac’s advice and gave students an entrance slip to complete as soon as they walked in. It had one problem to solve and asked students to be honest and tell me whether they had actually watched the video or not. I immediately sorted the entrance slips into Correct/Incorrect piles and chose an incorrect one to project and go over on the board. Entrance Slip Results: 17/21 students watched (2 forgot, 1 was sick, 1 had a broken laptop). 12/21 nailed the entrance slip. 6 passed it in blank (the four who didn’t watch and two who didn’t get it). 3 made minor calculation/sign errors which made the graph wrong. Continuation of Lesson: Our periods are 48 minutes in length. After students got settled, completed the entrance slip, and reviewed the entrance slip, about 8-10 minutes had passed. Since the majority of students did well on the entrance slip, I decided to continue with my plan to have students extend the concept to some word problems. We did the first one together (in hopes that some of the students who did not succeed on the entrance slip would start to pick up the concept) and then students worked in groups to complete the other three problems. I made the rounds and targeted the students who did not get the entrance slip right. After about 25 minutes we discussed the problems as a whole class and I gave students an exit slip with two problems on it. Exit Slip Results: 15/21 nailed it. The other 6 all made minor calculation/sign errors, but understood the concept. Class Section #2: Students did not have any homework the night before. We started class with me giving the same notes (in person) that the other class had watched online. However, the notes page had a few more examples on it. We did three together, then the students tried a few on their own, and I had student volunteers solve some on the board. After that, students got into groups and worked on some practice problems. At the end of class, I gave students the same exit slip as my other class. Exit Slip Results: 11/16 nailed it. The other 5 all made minor calculation/sign errors, but understood the concept. Reflection: The exit slip results were pretty close in both classes, but I love how with my first class I knew immediately that 12 students completely understood how to do it before class even began and we could use class time to do an activity that I didn’t have time for in my second class. I think I would see better results if the flipping was more consistent, hence my desire to try if for an entire unit. The students seemed to really like it, they said it was really cool and low pressure watching me and taking notes at home. One of my ELL students watched it after school in my classroom when she stayed for extra help on another topic, and I observed her stopping, rewinding, and rewatching. She found it very useful to listen to me repeat things and then have time to look up words in her dictionary. The only major frustration I have doesn’t even have to do with flipping. 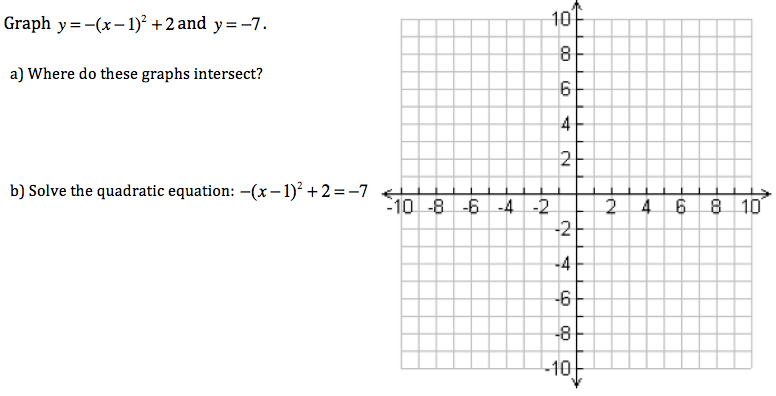 I should have been psyched that students in both classes were able to complete the process of calculating an intercept and graphing it after one lesson, but I don’t know what to do about the fact that negative signs and simple arithmetic cause my students to get problems wrong so often. How do standards based graders deal with this? Do you give full credit because the concept is right? And ignore the fact that the student divided 6 by 3 and got 3? Dividers, I have realized, are not necessary because they tend to make it harder for students to find and place their handouts… “Does this go under notes or classwork?” I don’t use dividers to organize my materials, so why should they? I’m going to teach students to place everything in the binder in the order that it is distributed, and document each sheet on the table of contents. Hopefully the large sticky note on my front table (BINDER!) will remind me to do this. The binder checks will be twice per term, consisting of five questions in which the answers can easily be found from note pages, class activities, and homework. If students follow the notebook directions, they should earn easy classwork points. If they don’t, they won’t. Old policy: I will accept any project late, for a penalty, until the end of each term. Old thinking: Life happens and sometimes you just can’t turn in a project the day it’s due. But I want every student to complete every project. So I wanted to give every possible opportunity for a student to attempt the project and change that zero in my online grade book. Problem: Students viewed my project deadlines and due dates as mere suggestions. They knew they had until the end of the term, so they procrastinated. Of course, there are always special circumstances. However, more often than not, students simply didn’t do the project on time because they knew they didn’t have to (and apparently I wasn’t harsh enough when penalizing points). New policy: Project is due ________________. A letter grade will be deducted each day the project is late (aka you only have five days to turn it in or it’s a zero). New thinking: I need to hold students more accountable and help them manage their time. I will set up project check-ins (more frequently during term 1) to make sure everyone is on track to finish on time. Students who I identify as needing extra help or time, will be given frequent teacher check-ins and email reminders. Students who do not pass in a project on the actual day it’s due will have a meeting with me and a quick email sent home. My hope is that by communicating this expectation from the beginning of the year, and enforcing it as the first project deadline comes and goes, the students will learn the importance of abiding by due dates.